Update: Please check out and join the "Canon Cat" Google Group -- that's where the Canon Cat activists meet these days. 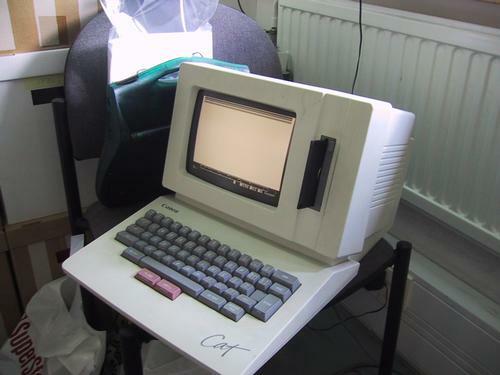 The Canon Cat is a word processing appliance which was sold by Canon in 1987. It was designed by Information Appliance, Inc. The Cat has a remarkably different user interface. It was a true information appliance which allows you to just type. It packs a surprising amount of power in a small set of tools and commands. This site collects some information on the Canon Cat. We hope to give people a feeling of how the Cat works. Every user interface enthusiast should know about the Cat and have a feel of the differently great world of the Cat. If you have additional material that we could add here, please send e-mail to haa@canoncat.org and we'll put it up here. You can also add your comments using the commentary feature on each page. Instructions on how to convert a Cat to run on 240VAC mains voltage. Canon Cat is programmed with the Forth language. See what you can do. There is some information available about the Canon cat on the net. Why the Cat is so Great? I have been interested in user interfaces for a long time. Different styles of user interaction should be more actively experimented with, unless we wish to live on desktop-window-icon-click jail forever. The Canon Cat originally built by the great minds (e.g. Jef Raskin et al) at Information Appliance, Inc is one great example of doing different things. It is really astonishing that the Cat (which sold about 20.000 during 6 months in 1987) became a real product. Most of the time, new different solutions die before they get the chance to be tested in real life. Jef Raskin, who was behind the Canon Cat, also created Apple's Macintosh computer, at a time when 80 column displays were the high-end of computing. Think about it. I read about the Canon Cat in several user interface articles and books (including Jef Raskin's The Humane Interface). The descriptions really intrigued me so I bought a 'Cat from Ebay. It really works in a different way. The hardware feels a bit 1980's, but the ideology is still from the future. Now that we're moving towards a new kind of computing platform, PDAs and other small-sized mobile devices, we have a chance of doing things differently. Let's go and do it! Here's a quick picture of the Canon Cat. Notice the two leap keys under the space bar.